This year we used Apologia Astronomy as our main science text. I had heard numerous good reviews about the series but wasn’t sure if the books would be beyond our level or if they would hold the kids’ interest. The Astronomy book was a huge hit! We covered a chapter of the book each week-with a couple of the longer chapters taking 2 weeks. We did science each day with a short read aloud time, followed by discussion, and then online images or youtube videos. Curly also worked halfway through a lapbook that corresponds to the book. The book has 14 chapters and I think we covered the material in 16 weeks. Each chapter is divided into smaller sections; many sections are about a page long. We would read 1 or 2 sections per day during our science time. I found additional images or videos on the internet to compliment the book. Each chapter ends with an experiment or project. And I’ll be honest, we didn’t do any of the projects. Some were too much work for me to put together and I knew my kids would not have the patience to complete each step. Overall, the experiments are fairly simple but my kids would enjoy them much more as they get older and can complete a few of the steps in the projects by themselves. Is the book appropriate for a young elementary student? For us, the answer is yes. My kids greatly enjoyed snuggling in the bean bag chairs reading the books and watching videos about space. 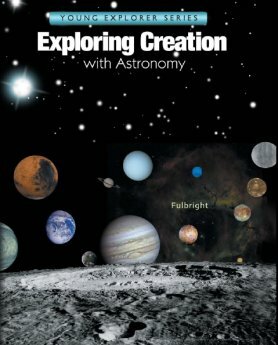 There were some sections of the book that I skipped simply because the information would be over their heads-I skipped most of the Creation Confirmation sections because the arguments for creation were too much for the ages of my kids. I enjoyed reading them myself though. We loved the read aloud format with the pictures throughout the text. The books uses many scientific terms but they are clearly explained and the language is accessible even to young students. The chapters on the various planets held the attention of Tiger who was still 3 at the time we were reading the book. The Narration sections in the book encouraged us to have discussions about each chapter to make sure the kids were retaining the information. Overall, they learned quite a bit of information from the book and have retained it well. Apologia also makes a notebook journal to correspond to each of the books, but I think Curly would enjoy it more if she were a little older and writing more independently. Several companies also make lapbooks based on each book. We enjoyed having the options available to choose which would work best for us. The books are light on experiments which was a positive for us since I knew we would not be able to complete multiple experiments this year. The book didn’t last us very long! I wasn’t prepared to complete the entire book in one semester. I enjoyed studying one topic in depth but we missed the variety of covering more than one topic each year. The book contains very few experiments which was a positive for us, but our science time became part of our read aloud time. I could not shake the feeling that we should actually be *doing* something as part of science. Most of that is my fault for not planning ahead for the experiments or not adding in hands-on elements to the lessons. Home Science Tools provides a kit to correspond to Apologia books and that might have helped us attempt some of the experiments. Overall, my kids loved Apologia Astronomy for science. We plan to use Botany next year, but we’ll only use it for one semester. We might try one of the new junior journals (if it’s available for Botany in time) to see if it helps retention or adds some variety into our science time. I will plan an additional topic or curriculum for the other semester so we can enjoy a change of pace midway through our year. I’m excited to have a science text that is in-depth and in-line with our Biblical beliefs. The kids will be using it as a reference book for years to come and Curly sometimes pulls it off the shelf to reread portions or glance through pictures. We love these and have used them for years! We typically do one a year, if you use the notebooks you can find guides that will take you through a chapter every two weeks. The swimming creatures one is still our favorite! So glad you enjoyed it! I am so glad I decided to try one out this year! We can't wait to continue with the series. I am looking forward to all the animal ones and the new anatomy one looks fascinating too!